inscription: Per S.B. - Verso: "Pond Farm" and jug shape are inscribed. Per S.B. 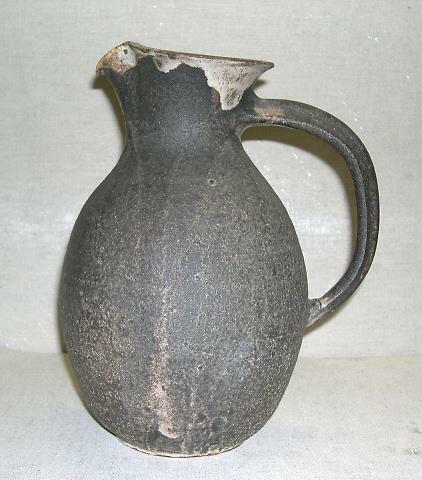 - Pitcher, buff stoneware. Deep charcoal-colored matt glaze with artfully applied white underglaze. It is an excellent form, characteristic of early work that strongly reflects Wildenhain's European training. Its full, rounded body leads to the neck and carefully wrought lip, shaped for pouring. A strong handle, harmonizing successfully with other elements, was applied.